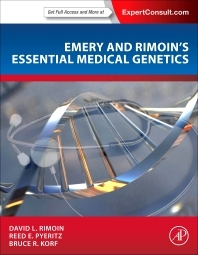 For decades, Emery and Rimoin’s Principles and Practice of Medical Genetics has provided the ultimate source for practicing clinicians to learn how the study of genetics can be integrated into practice. Developed in parallel to the sixth edition, and featuring 174 original contributions from the many authors of the full set, this one volume work expertly condenses and synthesizes the most clinically relevant content, for convenient desk reference. Helping to bridge the gap between high-level molecular genetics and individual application, it follows the multi-volume set in encompassing scientific fundamentals, full spectrum discussion of major inherited disorders, and actionable therapies. Clinically oriented information is supported by concise descriptions of the principles of genetics, research approaches, and analytics to embrace the evolving population of students, researchers, and practitioners who are integrating their work to provide advanced diagnosis, prevention and treatment of human disease. This print volume is complemented and enhanced with online access to the complete text, online-only references, and high quality illustrations on www.expertconsult.com. Intended for direct purchase by medical genetics practitioners and researchers in related areas. 18.2 Why Do We Age? 18.3 How Do We Age? Dr. Reed Pyeritz is a medical genetics doctor in Philadelphia, Pennsylvania and is affiliated with Hospitals of the University of Pennsylvania-Penn Presbyterian. Dr. Pyeritz focuses his research in two areas – Mendelian disorders of the cardiovascular system (especially those involving defects of connective tissue) and ethical, legal and social implications of human genetics. He is continuing his studies, begun over 20 years ago, of Marfan syndrome and related conditions – diseases in which the aorta and occasionally major arterial branches gradually enlarge and dissect, leading to early demise if untreated. Current efforts include a multicenter trial of angiotensin receptor blockade in Marfan syndrome, the identification of additional genes that predispose to arteriopathy, and improving methods for diagnosing and treating arterio-venous malformations, especially in hereditary hemorrhagic telangiectasia (HHT). Dr. Pyeritz directs Penn CIGHT (Center for the Integration of Genetic Healthcare Technologies). Supported by the ELSI Branch of the National Human Genome Research Institute, Penn CIGHT conducts research in the broad area of ‘uncertainty’ as related to the introduction of evolving approaches to assaying a patient’s genotype.